When you buy a new home, you may instantly begin dreaming about how to decorate your new abode, where to arrange furniture or which walls you’re going to paint what color. But don’t neglect one of the defining features of your home – the outside. Your landscaping says a lot about your new purchase. It’s the first thing visitors will see and it can make a lasting impression. 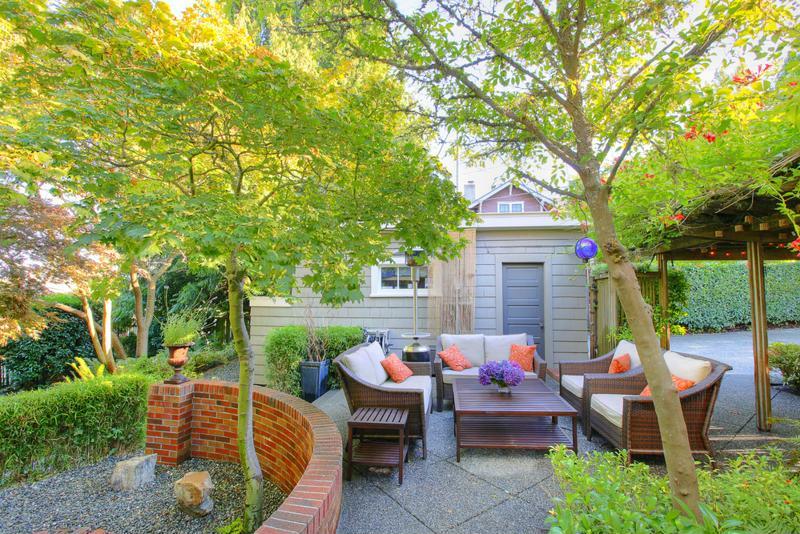 Good landscaping can benefit you in more ways, too. During the hot summer months, one of the biggest hits your energy bill takes is likely due to your air conditioning use. Luckily, there are some smart strategies to help reduce your need to crank up the A/C. Planting trees near your home can reduce the need for air conditioning. The trees will also provide shade for the outside of your home, which makes a suitable environment to grow hens and chicks, a type of succulent many homeowners like to plant near their home. These plants, or other shrubs and groundcover plants, can help cool the air surrounding your home before it makes its way indoors. Providing shade is the best way to prevent sunrays from entering your home and warming it up. A deciduous tree like a maple that is between 6 and 8 feet high can start providing healthy shade from the very first year, according to the U.S. Department of Energy. Within five to ten years, it could start shading your roof, too. A shaded roof will keep the rest of your home cooler in the summer. In dry or drought-stricken areas, it’s important that landscaping is carefully planned out so as to not require much water. If you plant a luscious garden during a drought, you may be faced with a tough choice: Either waste water to keep it alive, or let those flowers wilt and dry up. Neither scenario is ideal. The solution is to choose plants that don’t require much water, such as succulents, and take steps to make sure your plants make the most of the water they do get. Mulch can help keep the soil damp and reduce evaporation. Keeping your grass longer may help retain moisture, too. The DOE explained that you can also promote good water usage by planning out an efficient irrigation method. Diligent maintenance by pruning bushes, cutting the grass, pulling up weeds and eliminating pests and bugs can also help conserve water. How you structure your landscape can have an effect on the integrity of your home. Keep your mulch away from your siding to prevent the moisture from wicking into your walls and rotting, Angie’s List advised. Also, grade your yard away from your home to discourage rainwater from running towards your home. For information about buying your best home, talk to the experts at Lenox/WesLend Financial or call 844-225-3669. As heard on the radio, it’s the biggest no-brainer in the history of mankind.